On one of my recent posts, a commentor named “psycho” asked me some very good questions. I decided I needed to respond in more detail than just a single comment reply. I respond in pieces below, so just for context, here is psycho’s entire original comment. But if you take more meanings, and put them together to get yet another meaning. Don’t you feel like those meanings were again like symbols creating a new meaning? In my understanding, every bit of information is a symbol – what is represented by the invididual neurons in the brain. And if you take all related bits (that is neurons, symbols), and look at it as a whole, what you get is meaning. The sentence is a symbol, and it is made of word-symbols. And the list of word-symbols makes a meaning. Which, when given a name (or feeling), becomes a symbol, that can be further involved in other meanings. I’ll respond to each paragraph in a separate post, in order to get all of my thoughts down in a reasonably readable fashion. Here is part one. I try to make a very strong statement of the difference between symbols, signs and their “meanings”. Perhaps I’m being too analytical, but it allows my to think about certain types of information events in a way I find useful in my profession as a data modeller. So let me try to summarize here the distinctions I make, then I’ll try to answer this question. First, in my writings, I separate the thing represented by a symbol from the thing used as the representation. The thing represented I call the “concept” or “meaning”. The thing which is used to represent the concept I have termed “the sign”. A symbol is the combination of the two. In fact, a specific symbol is a discrete object (or other physical manifestation) built for the express purpose of representing something else. That specific symbol has a specific meaning to someone who acts as the interpreter of that symbol. As I have come to learn as I continue reading in this subject area, this is a somewhat ideosyncratic terminology compared to the formal terms that have grown out of semiology and linguistics. To that I say, “so be it!” as I would have a lot of re-writing to do to make my notions conform. I think my notions are comparable, in any case, and don’t feel I need to be bogged down by the earlier vocabulary, if I can make myself clear. You can get a feel for some of my basic premises by poking around some of my permanent pages, such as the one on Syntactic Media and the Structure of Meaning. There is obviously a lot of nuance to describing a specific symbol, and divining its specific meaning can be a difficult thing, as my recurring theme concerning “context” should indicate. However, within my descriptive scheme, whatever the meaning is, it is not a symbol. Can a symbol have several meanings? Certainly. But within a specific context at a specific time, a specific symbol will tend to have a single specific meaning, and the meaning is not so fluid. While I can use that sign when I describe to you any of those specific meanings, in and of itself, absent of other symbols or context, it is just a sign with all of those ambiguous, potential meanings, but in the context of our discussion, it has no specific meaning. you and I now tacitly understand. Just as a stop sign has been constructed following rules we have been trained to recognize. Imagine now a warehouse at the Department of Transportation where a pile of new stop signs has been delivered. Imagine they are laid flat and stacked on a pallet, just waiting to be installed on a corner near you. While they lay in that stack, they certainly have substance, and they each have the potential to mean something, but until they are placed into a proper context (at a corner by a road) their meaning is just as ambiguous as the word sign above. If you were driving a fork lift through the warehouse and came upon the pallet, would you interpret the sign right then as applying to you? Probably not! Could you say, just be looking at an individual instance of a sign, exactly which cars on which road it is intended to stop? No, of course not. So this is the distinction between the sign and the meaning of a symbol. The sign is a physical construct. When placed into a recognized context, it represents a specific meaning. In that context, the sign will only carry that one specific meaning. If I make another instance of the sign and put it in a different context, while the signs may look the same, they will not mean the same, and hence I will have made two different symbols. But make no mistake, while i have now expressed several different ideas to you using the same sign in different contexts, they are each, technically, NOT THE SAME SIGN AT ALL! Rather they are four examples of a type of sign, just as each of the stop signs on that pallet at the DoT are examples of a type of sign, but each is uniquely, physically its own sign! This subtlety is I think where a lot of people’s thinking goes awry, leading to conflation and confusion of the set of all instances of a sign with all of the concepts which the SET of signs represents. To make this easier to see, consider the instance of the word (sign) “blue” above which I have colored red. That is a specific example of the “blue” sign, and it has a specific, concrete meaning which is entirely different from the word (sign) “blue” above which I have colored green. The fact that both phrases have included a word (sign) of “blue” is almost coincidental, and does not actually change or alter the individual meanings of the two phrases on their own. But if you take more [signs], and put them together to get yet another meaning. Don’t you feel like those [signs] were again like symbols creating a new meaning? And to this question, it should be clear, that my answer is “Yes, precisely: when you put other signs together, you create new meaning”. What follows is a detailed example of the thought process followed by a software developer to create a class of data structures and how meaning is attached to those structures. An employee is a human being or person. Each employee has a unique identity of their own. Each employee has a name, which may be the same as the name of a different person or employee. Being human, each employee has an age, calculated by counting the number of years since they were born up to some other point in time (such as present day).Each person of a certain age may enter into a marriage with another human being, who in turn also has their own identity and other attributes of a person. To represent this information using data structures (i.e., to project the meaning of this information onto a data structure), we might tie the various concepts about a human being/employee to a computer-based data structure. Recognizing that a human being is an object with many additional characteristics of which we might want to know about, we might choose to project the concept of “human beings” or “people” onto a relational table and the concept of a particular individual onto one of that table’s rows (or a similar record structure). This table would represent a set of individual human beings, and onto each row of the table would be projected the meaning of a particular human being. Saying this again in a more conventional manner, we would say that each row of the table will reference a singular and particular human being, the all of the rows will represent the set of all human beings we’ve observed in the context of our usage of the computer system. In a more mathematical vein, we would define a projection Þ from the set of actual human beings Α onto Š, (Þ(Α) |–> Š), the set of data structures such that for any α in Α where α is a human being, there is a record or row σ in Š that represents that human being. A record data structure being a conglomeration of fields, each of which can symbolically represent some attribute of a larger whole, then we might project additional attributes of the human being, such as their name and identifier, to particular fields within the record. If σ is the particular record structure representing a particular human being, α, then the meaning (values) of the attributes of that person could be associated with the fields, f1..fn, of that record through attribute-level projections, ψ1..ψn for attributes 1 .. n.
When modeling a domain for incorporation into computer software, the modeler’s task is to define a set of structures which software can be written to manipulate. When that software is to use relational database management systems, then the modeler will first project the domain concepts onto abstract relational structures defined over “tuples”. These abstract structures have a well-defined mathematical nature which if followed provides very powerful manipulations. The developer projects meaning onto relations in a conventional way, such as by defining a relation of attributes to represent “PERSON” – or the set of persons, and another relation of attributes to represent “EMPLOYEE” – or the set of persons who are also employees. Having defined these relational sets, the relational algebra permits various mathematical operations/functions to be applied, such as “JOIN” and “INTERSECTION”. These functions have strictly defined properties and well-defined results over arbitrary tuples. The software developer having projected meaning onto the individual relations, he is also therefore able to project meaning on the outcomes of these operations which can then be used to manipulate large sets of data in an efficient, and semantically correct way. As the developer creates the software however, they must keep in mind what these functions are doing on two levels, at the level of the set content and at the level of the represented domain (the referent of the sets and manipulations). Thus the intersection of the PERSON and EMPLOYEE relations should produce the subset of tuples (records, etc.) which has its own meaning derived from the initial projected meaning of the original sets. Namely, this intersection represents the set of PERSONS who are also EMPLOYEES, (which is the same, alternatively, as the set of EMPLOYEES who are also PERSONS). This is an important point about software: the meaning is not simply recorded in the data structure but the manipulations of the data by the computer themselves have specific connotations and implications on the meaning of data as it is processed. As a typical practice in the projection of information onto data structures within the relational model, there will usually be a repetition of the information projected onto more than one symbol. In particular, the reference to the identity of a single person will be represented both by the mere existence of a single row in the table, and also by a subset of fields on the row which the software developers have chosen (and which the software enforces) for this purpose. In other words, under common software development practices, each record/row as a conglomerate entity will represent a single person. In addition, there will be k attributes (1 <= k <= n) on that record structure whose values in combination also represent that same individual. These k attributes make up the “primary key” of the data structure. The software developer will use and repeat these columns on multiple data structures to permit additional concepts regarding the relationship between that person and other ideas also being recorded. For example, a copy of one person record’s primary key could be placed on another person record and be labelled “spouse”. The attributes which make up the primary key often have less mechanical meanings as well (for example, perhaps the primary key for our person includes the name attribute. As part of the primary key, the name value of the person merely helps to reference that person. It also in its own right represents the name of the person. What follows is a high level summary of how humans attach meaning to various kinds of data structures within a computer. It will serve as a good baseline account, though certainly not an exhaustive one, providing a model upon which more detailed dicussion can begin. Computer systems provide functionality to support the performance and record of business processes. They do that through three inter-related features: DATA, LOGIC, and PRESENTATION. The presentation consists of information displays permitting both an information visualization aspect and an information capture aspect. The logic consists of several aspects, much of it having to do with support of the presentation and manipulation of displays, but also a lot of it having to do with creation, transformation and storage of data. Data consists of sets of symbols constructed in a systematic, regular fashion using a set of data structures. Different data structures are constructed to represent different aspects of the recorded activity. It is in the relationships between the macro and micro structures where the specific detailed information captured.generated by the business process resides. By following a codified, rigid construction of its data structures, the computer system is able to record multiple recurring instances of similar events. Through the development of fixed transformations using program logic, the computer system is able to make routine, conventional conclusions about those events or observations, and it is able to maintain and retain those observations virtually indefinitely. An obvious observation, at least on its face, is that different computer systems will store data representing similar ideas using different structures. We need to keep this in the back of our minds as we progress through the rest of this discussion, but it will be more directly adressed in other entries. A final thought concerns sets of data of similar structure, called a POPULATION. A population of data consists of some set of data symbols, all constructed using the same data structure pattern which represents a set of similar ideas. The classification of populations of data structures applies to the DATA portion of systems, represents an analogous classification of sets of observed events external to the computer system, and is affected by and affecting the LOGIC and PRESENTATION portions of the computer system. A more detailed definition of the notion of a “population” will also be treated in separate sections. Many computer systems, especially those built in support of business (or other human activity) processes, are constructed using a conventional system of abstract data structures. (When I say they are “conventional” what I mean is that the majority of software developers follow conventional patterns for the construction of data structures to represent their idiosynchratic subject areas.) Whether these structures are called “objects”, “tables”, “records”, or something else, they typically take the form of a heterogenous collection of smaller structures grouped together into regular conglomerations. Instances or examples of the larger collections of data structures will each be said to “represent” individual intances of some real-world conglomerate. Each of the individual component element structures of these conglomerations will each be said to represent the individual attributes or characteristics of the real-world conglomerate object. In order to permit efficient processing by the computer, instances of similar phenomenon will be represented by the same kind of conglomeration. Typically, business systems will be based on a data structure called a RECORD. Records consist of a series of “attribute data structures” all related in some fashion to each other. (A more complex structure called an “object” still has record-like attributes combined together to represent a larger whole, the nuances and variation of object-based representation is a subject for later.) Each RECORD will stereotypically symbolize one instance of a particular concept. This could be a reference to and certain observed details of a real-world object, or it could be something more ephemereal like observations of an event. For example, one “PERSON” record would represent a single individual person. RECORDS themselves consist of individually defined data elements or FIELDS. Each RECORD of a particular type will share the same set of FIELDS. Each FIELD will symbolize one kind of fact about the thing symbolized by the RECORD. For example, a NAME field on a PERSON record will record what the represented individual’s name is, at least as it was at the time the record was created. The set of all records within a system having the same structure will typically be collected and stored together, often in a data structure called a TABLE. Each TABLE will symbolize the set of KNOWN INSTANCES of whatever type of thing each record represents. TABLES are also described as having ROWS and COLUMNS. Each row of a table is one RECORD. The set of shared element-attribute structures across the set of rows can be described as the “columns” of the table. Each column represents the set of all instances of a FIELD in the table, in other words, the same field across all records. Tables are a commonly used data structure because they readily support interpretation using relational algebra and set theoretic operations, as well as being easily presented and understood both by human and computer. The nomenclature of “record”, ” table”, “row”, “column” and “fields” describes the construction building blocks of an abstract syntactic medium whose usage permits humans to represent complex concepts within the computer system. By assigning names to various collections and combinations of these generic structures, humans project meaning onto them. Using diagrams called “data models”, a short hand of sorts allows the modeler to describe how the generic tables and fields relate to each other and what these relationships signify in the external world. These models also, by virtue of the typified short hand they use, allows for the generation of computer logic that can be applied to a database to support certain standard operations and manipulations of the data generated by a computer system. Traditional data modeling results in the creation of a data dictionary which relates each structural element to a particular kind of concept. Every structure will be given a name, and if the developers are diligent, these can be associated with more fully realized text descriptions as well. Some aspects of the data structures are not described, at least typically, within a data model, such as populations or subsets of records with similar structures. Traditional data dictionary entries record name and description of the set of all structures contained in a table. Using a set of structures to represent a set or collection of similar objects is itself a symbolic action. So not only does each row in a table represent one instance of some type of thing, and each column represents one observed (or derived) fact or attribute of that instance, but the collection of all instances of these row data structures also represents the logical set or population of these things. The strategy for applying meaning to these data structures begins when the decision is made to treat the entirety of each record as the representation of a member of a population of like things. Being similar, then, a set of fields is conceived to capture various detailed observations regarding the things. These fields are intended to capture details about both how each thing is different from the other things in the collection, but also how different things may share similarities. Much of the business logic of the application system will be consumed by the comparisons between individual things, and the mathematical derived counts (and other metrics) of those sets of things (and of subsets within). Using the computer to compare the bit sequences contained in each field, the computer will indicate whether these contents are the same or different between different instances. Humans will then interpret the results of these comparisons by projecting the conclusion out of the computer and into the conceptual world. For example, let’s say that we have defined the computer sequence “10101010” to represent a reference to a specific person, “Julie Smith”. If we take two different instances of bit sequences and compare them in the computer, the computer will tell us if they are the same or not. As humans, we would then interpret the purely electro-mechanical result which the computer calculated that “10101010” and “10101010” are the same as an indication that the two instances of these sequences represent the same specific person. Likewise, we would interpret a computer result indicating that two bit sequences were not the same as an indication that different people were being referred to. This type of projection of meaning from mechanical result to logical inference is fundamental to the way humans use computers. The specific number of fields and their bit sequence representations (data types) that are developed within a computer application is entirely dependent on the complexity of the problem domain and the attributes of the objects required to reason over that domain. However, no matter how simple or complex, it is the projection of meaning onto the representation of these attributes in the computer and the projection of an interpretation onto the results of the computer comparisons of the physical representations which makes the computer the powerful engine that it is in our society. The Artist creates her artwork, with a particular symbolic meaning in mind. The Art Dealer/Gallery Owner tries to explain what the artist had in mind. The Art Critic sees something somewhat different by projecting his own notions on the work. The Art Historian synthesizes what she’s heard, and unwittingly, and unbenownst guesses some of the original intent. Ultimate truth is the one written by History, so over time, this final interpretation becomes the accepted meaning. Today’s discussion asks that you perform a thought experiment. Imagine that you are sitting in a room with a bunch of other people. All of your chairs face to the front of the room where there is a large desk. A young woman walks in with a stack of papers and places them on the desk. She picks up a piece of chalk from the desk, then, still standing, she turns to face all of you, smiles and begins to speak. Right here I’m going to pause the narrative and ask that you consider the situation. Imagine it in your head for a moment. What is the context Ive described? So what do I mean by context? Well if I were to say that our story so far is a very familiar context for most of us, one we all remember from childhood: an elementary school classroom, then here are some of the things you might expect to happen. Do you recognize this context? Feels familiar and confortable, right? Great! Let’s hold this thought now and count slowly to twenty while we let the memories of this context play about in our heads. Now let me throw you a little curve ball and tell you that you’ve been thinking about this in the wrong way. The situation I described is not really a classroom and that woman is not a teacher. She’s an actress, presenting a one-woman show about a famous teacher. The desk is a set, the papers just props. You are not in a classroom, you are in a theater made to appear as a classroom. This is just a play and you are a member of the audience. In fact, so there’s no doubt in your mind about this, you suddenly remember you put your ticket stub in your front pocket. Did you feel that grinding sensation in your head as you read these last few sentences? That shifting from the classroom to the theater context – you should actually be able to feel it happen in your mind. The fact that even this little bit of information has allowed you to sense a shift in context is not a trivial matter. Usually, when you switch contexts like this, it is never so palpable or apparent. We humans are switching contexts all of the time, sometimes in the same sentence. 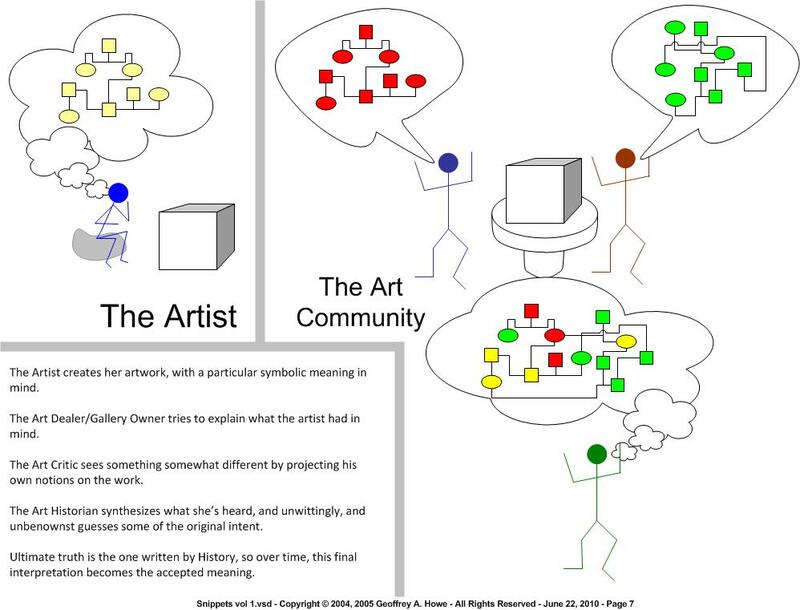 It is one of our particular talents to recognize and adjust our conceptualizations at will when the context changes. So, shifting contexts is easy. And thus, I end this little monologue by pointing out that really, dear reader, we aren’t in a theater either. Instead, we’re sharing a context called “reading a blog entry”. I hope you enjoyed this little exercise! If it’s true that every human grouping can form its own context, how can communication occur between different groups? If one group defines a set of symbols using some set of concepts and a syntactic media that is different from those of another group, as a practical matter, how can the chasm be spanned? The answer is through the development of bridging contexts. The following figure depicts several common strategies, each with its particular benefits and drawbacks. There are three basic forms of bridging contexts. First and perhaps the most common in the real world is the creation of a specific, point-to-point bridging context through discussions/negotiations between the representatives of the two specific contexts. Most organizations take this approach because it simplifies, focuses and shortens the discussion, leading to faster turn-around. All application and data interfaces that are custom-built as point-to-point connections, no matter what the actual transmission protocol or language used, fall into this category. 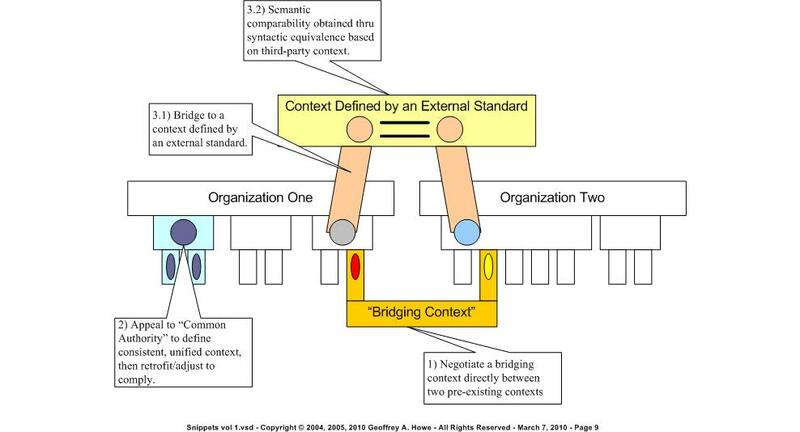 The second form of bridging context occurs when two groups rely on a pre-existing, parent context to act as the bridge. The parent context may push a common context down onto the previously individual contexts, or the two contexts may appeal to the parent to resolve the conflict. In either case, the result can be that the child contexts become absorbed by the parent context, thus eventually what began as a bridging context becomes the entire context. These forms of bridging contexts are often common in such situations as corporate mergers, enterprise architecture initiatives, and business process reengineering projects. The third form of bridging context is found whenever an organization selects a third-party standard as a communications protocol. In these cases, the organization creates a bridging context between itself and the external standard, including mapping its symbols into those of the standard. Theoretically, once completed, the organization can use such a bridging context to communicate with other organizations that have likewise built bridges to the standard. In practicality, however, it is not uncommon that organizations will bias their bridging context to their own point of view. When this happens, the external standard devolves into mere syntax, and other organizations must create new, subtle bridging contexts (a la form number one) in order to communicate successfully with this organization. This was a common occurrence in the heyday of Electronic Data Interchange (EDI), and still occurs today even with more modern, XML-based standards. While proponents of standards bodies decry other approaches, it must be stated that the third form of bridging context is also the most complicated to develop, as well as requiring the longest amount of time to establish, and is often the hardest to maintain. The reason for this is that it requires so many more people to define, and for most situations, the key to its success is also its biggest drawback, namely that the context is defined externally to the organization. Thus, the interplay among the membership of the standards body creates the external context. The organization has a business activity establishes the local context. The humans involved in establishing the bridging context must be able to translate from the local context to the external standard. There is always a risk that these individuals will misunderstand the external standard and translate their local context to it incorrectly. In addition, the bridging context must be maintained constantly as changes occur both in the standard and in the internal organization. At least within the local context, it is more likely that a change will be noticed. In addition to EDI and XML protocols, other examples of the third form of bridging context would include Semantic Web approaches, but also such mundane approaches as the use of ERP systems, or any other packaged application where a fixed syntactic media is presented.